Curry leaves belong to Rutaceae family and the plant is scientifically known as Murraya Koenigii Spreng. The height of the curry plant may be small or medium. It is native to India and cultivated in various other countries also such as Australia, Nigeria, Ceylon and China. These leaves have several medicinal properties such as antioxidant, antimicrobial, anti-diabetic, anti-inflammatory and hepato-protective properties. Leaves are used in various cuisines in India and other parts of Asia. Curry leaves are packed with calcium, fiber, carbohydrates, phosphorous, iron, vitamin A, Vitamin B and vitamin E. These are also help your heart function better; rejuvenate your hair, fights infections and skin with vitality. Phenols, carbazole alkaloids present in the curry-leaves which are help in fighting cancer such as prostate cancer, colorectal cancer. Deficiency of vitamin A cause night blindness (nyctalopia) and in some cases even total loss of vision.Curry leaves contain high amount of vitamin A which protect the cornea and improves your vision. Curry leaves are also helpful for skin. Apply leaves juice or paste on cuts, burns, skin irritations and insect bites for a quick recovery and clean healing. Lack of vitamin B causes hair loss. Curry-leaves are rich source of vitamin B which helps make your hair stronger and healthy. Leaves contains anti-bacterial and anti-inflammatory properties which in turn help in combating an upset stomach and also reduce the side effect of diarrhea. Curry leaves contains antioxidants which prevent the oxidation of cholesterol that forms LDL cholesterol (low-density lipoproteins) and protect from heart disease and atherosclerosis. Tannins and carbazole alkaloids present in the leaves help protecting the liver from various diseases such as cirrhosis and hepatitis. Curry leaves are an efficient home cure to cure problems related to deficiency of vitamins A & C and compounds like Kaempferol which is a powerful anti-inflammatory, antioxidative agent and decongestant. Leaves help to release congested mucous. 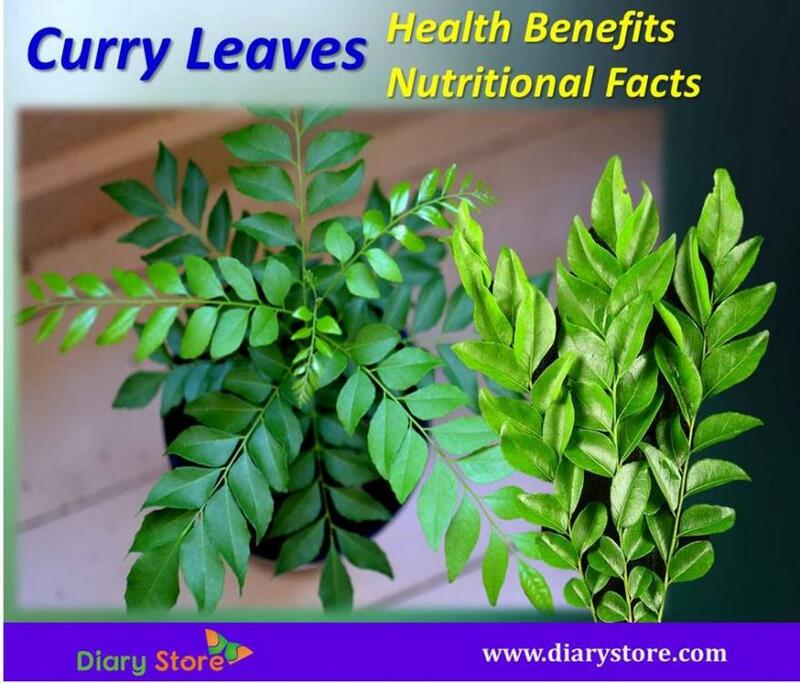 Curry leaves are rich source of folic acid and iron. Folic acid is mainly responsible for carrying and helping the body absorb iron. Leaves are natural remedy to reduce anemia. Curry leaves contain fiber and help lower the blood sugar levels. 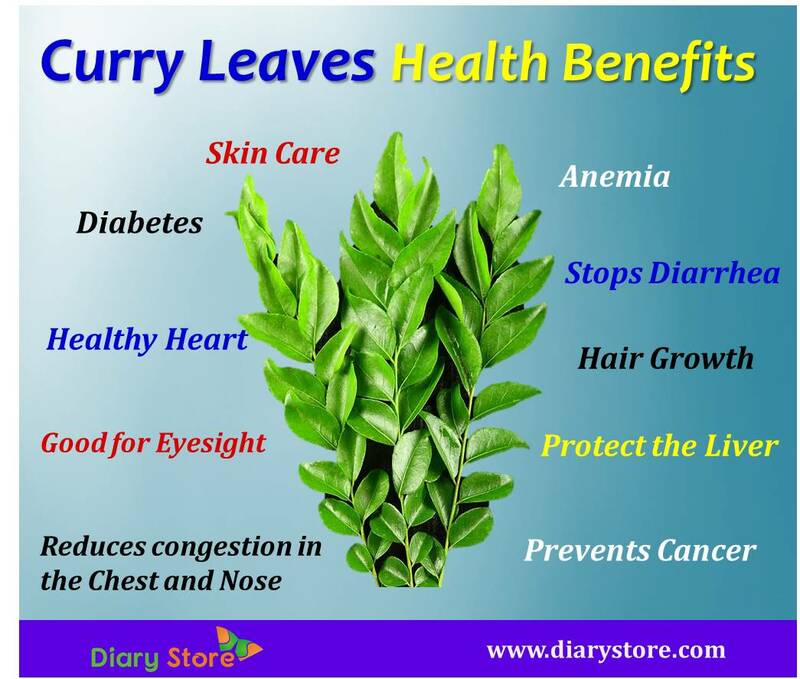 If you are suffering from diabetes add curry leaves in your diet.